If San Francisco’s chilly marine layer is putting a damper on your summer fun, we suggest a day trip. Sacramento may not be on your short list of weekend escapes, but a stylish new rooftop infinity pool and cocktail bar is certain to change that. The Kimpton Sawyer Hotel is part of a new downtown, state-capital–invigorating hub centered around the Golden 1 Center, an open-air concert and sports arena that’s home to the Sacramento Kings. In addition to a dreamy rooftop pool terrace, this one-stop, warm-weather retreat has reliable Sacramento sun and a collection of hip bars and restaurants. Plus, the hotel is a breezy, five-minute stroll from the historic Amtrak station, which means you can ditch your car and enjoy a scenic, traffic-free trip out of town. The design-forward hotel features a sky-high lobby that brims with greenery and 250 guest rooms awash in natural finishes and gold accents. Perks include Atelier Bloem body products, an evening wine tasting and public bikes for quick jaunts to the buzzy Midtown neighborhood. 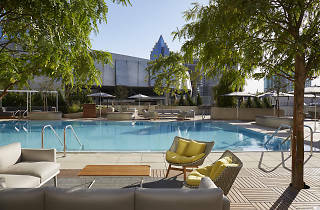 Yet the property’s most compelling amenity is the infinity pool—a first for Sacramento— surrounded by a lushly landscaped rooftop and flanked by cabanas, fire pits and the glam indoor-outdoor cocktail lounge, Revival.